Visit this quaint seaside residence that has played an important role as a residence for many historical individuals, including a number of presidents, especially Harry S. Truman, who stayed here for a total of one hundred and seventy-five days while sitting as president. That is how this building became named the Harry S. Truman Little White House. Constructed in 1890 to house officers on the naval base on Key West, it was originally a duplex that was home to the commandant on one side and the paymaster on the other. This wooden building, sitting on the shore of the harbor, was converted into a single residence for the base commander around the start of the Twentieth Century. There have been plenty of distinguished guests who have spent time in this coastal retreat. Perhaps the most famous person to live in this house was one of the most innovative inventors of all time, Thomas Edison. Mr. Edison lived at this house during the First World War while working for the U.S. Department of Defense by helping to design depth charge technology for the United States Navy. President Harry Truman first vacationed in the house in 1946. This residence earned the nickname of the Winter White House. After suffering from a heart attack, President Dwight D. Eisenhower recuperated at this retreat in 1956. The house hosted President John F. Kennedy and British Prime Minister Harold MacMillan in 1961 while the two world leaders attempted to diffuse potential altercations with Cuba and the USSR during the Bay of Pigs episode. Even after the Truman Naval Station ceased operations in 1974, the Little White House continued to host former and current world leaders. Former President Jimmy Carter vacationed and celebrated New Years Eve here with his family and close friends in 1996. The Joint Chiefs of Staff of the United States, as well as the European powers of France, Great Britain, and Germany enjoyed a private dinner with their spouses in 2000. 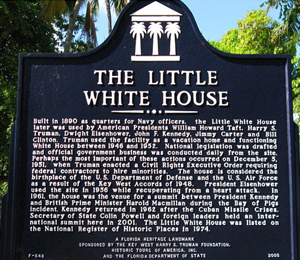 I have been to the Bahamas many times, but Harry S. Truman Little White House is one of my favorite trips! It includes everything that everyone should do here. As a Bahamas veteran, I can say only the best about this experience!